Following the news of Deborah Watling’s death, I’m sure I wasn’t the only one to reach for this story. Back in the mid eighties though, if you wanted to see Victoria in action you were limited to either the second episode of The Abominable Snowman, episode three of The Enemy of the World or the first episode of this one (and that was always supposing that you were able to obtain a pirate VHS from a friendly contact). It’s very pleasing that season five is now much better represented than it was back then and, for me, it’s the two stories returned in 2013 – The Enemy of the World and this one – which are the real jewels in the crown. I first encountered Web 1 back in the late eighties, on a pirate tape along with a selection of other orphaned Hartnell and Troughton episodes (a bit like an early Lost in Time then, although the picture quality sometimes left a little to be desired). It’s therefore an episode which I’m very familiar with, having rewatched it countless times across the decades (always wondering whether the rest of the story would maintain this strong opening). Non-controversial statement – Douglas Camfield was Doctor Who‘s best director. It’s easy to see why he directed more stories than anybody else – his skill at crafting intriguing picture compositions (both in the studio and on film) was second to none and there’s plenty of examples to be found in this opener. Since studio time was always limited, most directors wouldn’t spend too long on creating interesting visual images – simply getting the actors to hit their marks and deliver their lines without bumping into the scenery seemed to be the top priority. Camfield, possibly due to the fact that he ran his productions with a military precision, was quite different as he was able to find the time to craft pleasing shot selections. A good example can be found in the early TARDIS scenes. 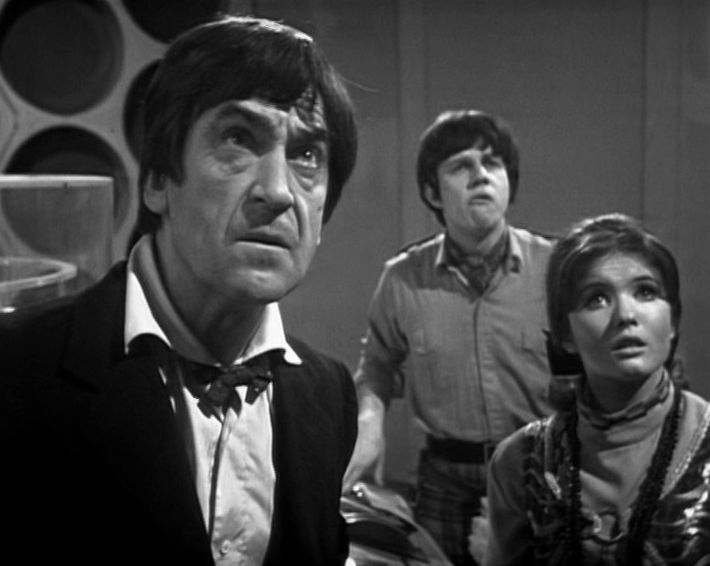 The Doctor, Jamie and Victoria, staring at the scanner screen, are positioned with the Doctor in front, Victoria behind him and Jamie at the back. In order to make this shot work, all three actors had to hit their marks exactly whilst the cameraman also had to be in precisely the right place. If anybody was slightly off, then the composition wouldn’t work. Many directors would simply have elected to line them up side by side (this would have been easier to shoot, but also would have looked unnatural – Peter Davison raises this point several times on his audio commentaries – the way that certain directors shot the TARDIS scenes very flatly). I assume the reason why the confrontation between Travers (Jack Watling) and Julius Silverstein (Frederick Schrecker) is recorded on film was because the underground sets took all the available studio space. Camfield always had an affinity with film (no surprise that he later graduated to all-film series like The Sweeney) which makes this scene a creepy pleasure. It’s true that Jack Watling gives a very broad performance (“stubborn old goat!”) and his facial contortions are something to behold, but presumably he was playing the part as written. Strong female characters aren’t terribly common during this period of the show, so Travers’ daughter Anne (Tina Packer) stands out rather. A scientist in her own right, she’s acidly polite when the hapless Captain Knight (Ralph Watson) attempts to clumsily chat her up. Compare and contrast this with The Invasion (which in its early drafts would have featured return appearances for Anne and Professor Travers). Anne’s replacement – Isobel – is a much more pallidly drawn character who’s happy to entertain romantic overtures from Knight’s counterpart – Captain Jimmy Turner. Whilst I may love The Web of Fear dearly, it’s not a story that makes a lick of sense. 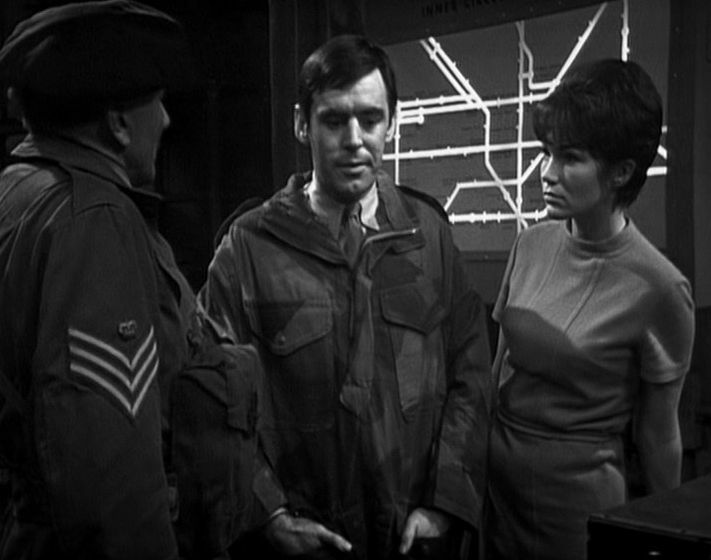 Firstly, if the Great Intelligence’s plan was to ensnare the Doctor, why envelop London in a web? After all this wasn’t the early seventies – a time when the Doctor was resident on modern-day (to the viewers) Earth. And the moment when the museum Yeti changes before our eyes from the cuddly Abominable Snowman version into the sleeker Web of Fear model might look good, but again it’s something which isn’t at all logical. Quibbles apart, this opener effectively sets the story up. We know what we’re dealing with (Yetis in the Underground!) and we’ve also been introduced to a varied cast of military characters who we’ll get to know better as the serial progresses. For many long years there seemed to be little hope that we’d ever get to see the rest of the story. And then in 2013 something remarkable happened …..